This is a graphical output challenge where the task is to give the shortest code per language. Your code should plot a single purple pixel (hex value #800080 or rgb(128, 0, 128)), moving clockwise round a circle. It should take exactly 60 seconds to make a full journey round the circle and should continue indefinitely. Nothing else should be shown on the screen or window except for the pixel. The width of the circle should be 0.75 (rounding suitably) the width of the screen or window and the background should be white. To prevent silly solutions, the screen or window should be at least 100 pixels wide. Your code should be a full program. You can use any language or library you like. However, I would like to be able to test your code if possible so if you can provide clear instructions for how to run it in Ubuntu that would be very much appreciated. Missing top twenty languages. Help needed. The following top twenty programming languages are currently missing any solution at all. 4 bytes thanks to Flambino. 1 byte thanks to Kritixi Lithos. This creates a default 100 by 100 pixel window with the required animation. Disclaimer: that image is not a GIF. Don't stare at it for a minute. QB64 is a QBasic emulator that adds some nice features. This program uses one (CLS,15) that isn't supported by vanilla QBasic. This is very loud. It uses the PLAY command to halt execution for a short while before clearing the screen; otherwise the pixel will flicker and become invisible. Download QB64, load this file, click Run and then Start. I took some tricks (SCREEN 7 instead of SCREEN 13, and PSET instead of POKE) from @DLosc's answer, so credit is due. As in his answer, my magenta is actually #8B008B, which was deemed acceptable by the OP. Because I've always had stupid ideas. Like golfing in Java ;) . Edit: Thanks for @Ypnypn for golfing 7 bytes! Edit2: Thanks for @Franz D. for saving 3 bytes! Creates a white circle that is hidden and places a point that follows its edge from 0 to 2π. Mathematica's DefaultDuration option let's me set it to complete a loop every 60 seconds. EDIT: Change Circle to Disk to save 2 characters, added a negative sign to t to make it move clockwise. EDIT: Saved 7 bytes by using the ~ operator (thanks to Mauris). Save as a .html file and open in a browser, that doesn't need vendor prefixes, like Chrome or Firefox. Or try this fiddle. Added 7 bytes. I thought nobody would notice, that there's a default easing on the animation. ;) I've set it to linear now. Saved 59 bytes by throwing everything abort that the browser will handle automatically. Saved 3 bytes by removing the trailing )}}. Thanks to toothbrush. Saved 2 bytes by using 12% instead of 12px which is the same value corresponding to the size of the parent element. Saved 55 bytes due to massive refactoring, also taken a lot of comments into account. Thanks a lot for all the contributions. For the TI-84+ CSE/CE calculators, which support some limited BASIC color graphics. The color here is magenta, or color 13 (one can also use the MAGENTA token). I use rand instead of 1 for the infinite loop condition to provide a tiny bit of delay (~15 ms) between when the pixel is displayed and when it is turned off again. Set your calculator to radian mode before running this program; I don't count this in the size because it's the default state. Also set Ans to 0 by entering a 0 before the program; this is also the default. Thanks to @quartata for testing this program (I don't own a color calculator). Thanks to @Peter Lenkefi, whose great solution got me started, and whose for-loop I shamelessly copied! The main saving was due to switching to pure AWT and rendering directly in the Frame -- no need for a JPanel (or Canvas). I also made the counter an integer variable, updated by simple increment, and saved a few bytes twiddling the constants to be able to strip a digit here and there. EDIT: Thanks to @Peter Lenkefi and @tobii for their suggestions in the comments. Beating HTML would be nice -- does anyone know how to reliably pause execution in Java without using sleep() and having to catch exceptions? Tested on QB64, which says it has a Linux version (though I've only tried it on Windows). SCREEN 7 sets the graphics mode. COLOR 5,15 sets dark magenta as foreground color and bright white as background color. DO ... LOOP is an infinite loop. Usually you would see it as DO WHILE ... LOOP (or you can put LOOP WHILE instead, or use UNTIL for a negated condition), but you can also leave the condition out, in which case it loops forever. TIMER is the number of seconds since midnight, as a floating-point value. PSET SETs a Point to a color, foreground color by default. i starts at zero and counts up by pi/300 each time through the loop, thus completing a full circle after 600 repetitions. We calculate pi as 4*arctan(1). The last line waits until 0.1 seconds have elapsed. The idiom that I learned from my QBasic books was t# = TIMER: WHILE TIMER < t# + 0.1: WEND. But we don't need double-precision numbers (marked with #) for a 0.1-second difference, and it turns out that the IF cond THEN [GOTO] line syntax is 1 character shorter than a WHILE ... WEND loop. The loop repeats 600 times in 60 seconds, thus completing a full circle. Color 5, dark magenta, is #8B008B instead of the requested #800080 (cleared with the OP). Screen mode 7 is 320x200, and so the circle has diameter 198, which isn't >= 0.75 of the width but is >= 0.75 of the height (also cleared with the OP). If you run this on DOS QBasic, it's fullscreen, so the "pixel" isn't actually a single pixel on the monitor (unless you happen to have a 320x200 monitor). But it should be close enough. QB64 runs in a window that uses the exact dimensions, and thus the pixel is a literal pixel. No pretty picture here. :( LICEcap's quality wasn't good enough to capture a single pixel accurately. The timing on the gif might be off. This one requires ImageMagick to be installed. The result is saved to a gif. The pixel is actually the tip of an analog clock's seconds hand. So this one is absolutely precise. This is a frames-per-seconds based alternative, inspired by the other answers. Although the documentation says the default fps is 10, practical tests shows it is actually 12. Both solutions take “The width of the circle should be 0.75 (rounding suitably) the width of the screen or window” literally: calculate based on window width, so the pixel occasionally may leave the bottom of a non-square window. Not sure how such case is expected to be handled. (Use minimum of width and height? Walk on oval path?) 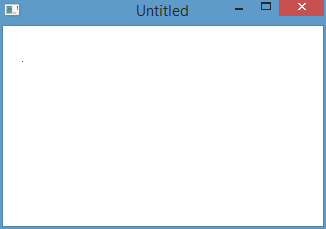 The window starts with default 600 x 500 size and is resizable. Just download those two individual files and put them in your same directory as the above code, then: dmd yourfile.d simpledisplay.d color.d to compile and then just run it. My little library was written to make quick animations like this fairly simple so this plays well to its strengths! Alas, I kinda like long identifier names and didn't provide a Point constructor that takes float so that adds 18 bytes casting and.... idk a couple dozen spelling out my method names. Depends on System.Windows.Forms and System.Drawing to run. Output is in a 1000x1000 window. Invalid markup from hell to breakfast, but it runs (in Chrome at least). Like a HTML5 canvas, the default size for an SVG appears to be 300x150, so that's what this is assuming. Edit: Whoops, I'd accidentally left in a duration of 6 instead of 60. Fixed that, but also found that 0.5 works as just .5, so no change in the byte count. 0000    B0 13 CD 10 BA C9 03 88 F1 BE 76 01 F3 6E B0 0F - °.Í.ºÉ.ˆñ¾v.ón°. 0010    49 68 00 A0 07 F3 AA 64 66 A1 6C 04 66 A3 80 01 - Ih. .óªdf¡l.f£€. 0070    B8 03 00 CD 10 C3 20 00 20 44 04 64 00 4B 00    - ¸..Í.Ã . D.d.K. ; - 16 bit implementation of an animated pixel that circumscribes a circle. ; a colour we can represent exactly in mode13 or any other mode with 6 bit regs. ;   xor     cx, cx                          ; cx = 0 - its zeroed by the rep outsb instruction above. rep     stosb                           ; es:[di] = 0F, inc di, dec cx. If cx != 0 then repeat. je      .drawLoop                       ; if so, return to start of loop - no need to delete and redraw the pixel in the same spot. ; Since this is a .COM file, all program, data and stack exist in the same segment. ; Using .text and .data sections only improves program readability - doing so only has minor effects on the binary produced. desiredCol          db  0x80/4, 0x00, 0x80/4        ; palette registers are only 6 bit. Copy and paste this address into your browser. Rename the resulting file golfcrcl.com and run in a DOS environment, i.e DosBox. Moves a purple pixel around an array used as an Image. Plots a pixel along a circular path in 60 seconds. This draws a clock, with ticks and labels in white, for which the second hand is a pixel. So this is probably the worst way to do anything, but I figured I'd try. Can be compiled on a Mac (mine anyway) with g++ -framework Cocoa file.mm and run from the terminal (ctrl-C to quit, since it's not an app). Edit: Saved 99 bytes: Fixed main() to run on OS X 10.10 (1st version only ran on 10.8), skipped translate/rotate in favor of plain trig calculations, stopped bothering with window placement, and other small stuff. Edit: Saved another 11 bytes: Skipped NSMakeRect and found a digit that just had to go. Edit: Saved another 14 bytes: Didn't need to assign the NSTimer instance to anything, and can apparently skip initializing r to zero. Edit: Saved another 15 bytes: I can't stop. Send help. Note that if we get rid of the imports and drawing the outline around the canvas, we're down to 149 bytes, but that's probably cheating! love.update() receives as parameter the time elapsed since previous frame. Draws in the default 800 x 600 window at fixed coordinates, as the window is not resizable anyway. Unfortunately, Adobe Flash isn't freeware, and Google informs that it doesn't work on Linux without a VM or Wine (and even with Wine, it only mostly works). Still, I wanted to see how well it would do on this task. Pretty well, it turns out. The basic idea: create a new movie clip object, position it at (200, 200), and then draw a dot2 in it 200 pixels farther right. Now the movie clip is 200 pixels wide and 1 pixel high. The pivot point is the original coordinates where we started, so when we modify the _rotation property, the dot moves in a circle around the point (200, 200). Conveniently, _rotation is in degrees; 0.25 degrees/frame * 24 frames/second * 60 seconds/minute = 360 degrees/minute. To run from scratch if you have Flash, create a new Flash document1, open the Actions panel, and paste the above code. No further customization is required, assuming the default white background, 550x400 canvas, and 24 fps. Hit Ctrl-Enter and watch it go. If you don't have Flash itself, you can still view the results with the free Flash Player, which should come with most modern browsers. Download the SWF file here. If you can't play it, try downloading this HTML page as well and opening it, with the SWF file in the same directory. 1 Tested on Adobe Flash CS4 Professional, choosing "Flash File (ActionScript 2.0)" when asked what type of new file to create. 2 Actually a small triangle, as you'll see if you zoom in on it enough. It was the golfiest way I could find to draw a dot. This is maybe not quite by the book. The default size of a canvas (in Chrome at least) is 300x150, so I've centered the circle on 75x75. I could center it on 150x75, and make its radius 113px (~75% of width), but it'd be outside the canvas some of the time, so I chose ~75% of height instead. Unfortunately, this language is only supported on Windows (though it may run in Wine). I just submit this for you, Lembik, to have a complete list.